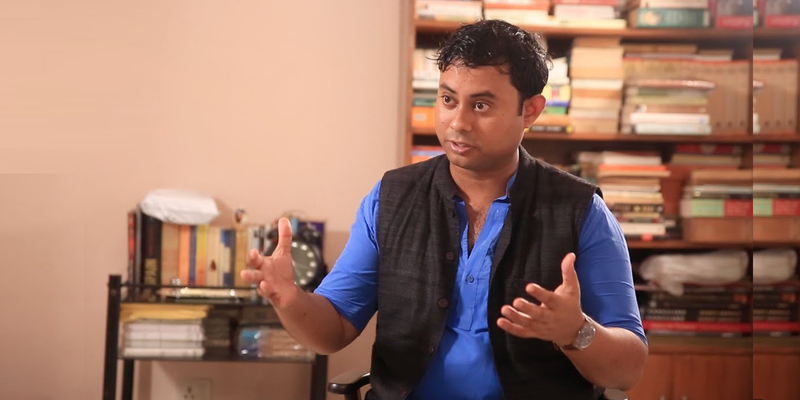 Hindol Sengupta is a journalist, entrepreneur and an award-winning author of eight books. He won the Wilbur Award in 2018 for his book “Being Hindu: Understanding a Peaceful Path in a Violent World”, which happens to be the first book on Hinduism to win the prestigious prize given by The Religion Communicators Council of America. Earlier he was awared the PSF Prize for public service in India in 2015. His book “Recasting India: How Entrepreneurship is Revolutionizing the World’s Largest Democracy” was short-listed in 2015 for the Hayek Prize given by the Manhattan Institute in memory of the Nobel laureate economist F. A. Hayek. Sengupta is a World Economic Forum Young Global leader and a Knight-Bagehot Fellow at Columbia University. Indictoday recently had an engaging interview with him. Q: Welcome to Indictoday! You have written books on famous Dharmic personalities as well as Economic liberalism and entrepreneurship. How do these two apparently diverse ideas connect? Is Dharma more conducive to left-wing economics or right-wing economics, broadly speaking? A: Thank you, and congratulations on the new initiative. I, actually, do not think of my work as ‘economic’ or ‘history’ or ‘religion’. I do not bracket, my ‘historical writings’ or ‘economic writings’. To me, my work is a meandering line or thread that connects one theme – that of an Indian way of thinking and imagining the world. I have often said in my lectures that in order to truly develop a sense of universal-ism, we must first acutely understand ourselves. Just as you cannot be truly plural without first understanding, deeply, the unitary, you cannot globalise unless you understand with compassion your own surroundings and communities. I am a believer in globalisation. But I belong I think to a new wave of people thinking about globalisation who are less naive and less arrogant about what globalisation really means. The first wave was full of people who told us that “the world is flat” and “everyone was at home everywhere” and “there is no such thing as home anymore”. Today it is laughable to think that only ten or twenty years ago, people who said this sort of thing were celebrated as visionaries and prophets. Of course today we know how disastrously wrong they were. But why were they wrong? They were wrong because what they had, really, was an insular vision of globalisation. Their globalisation was based on carpet bombing the world with uniformity. They believed that if we all started wearing Levis jeans and if we all ate at McDonalds, we would become “the same”. When talking about the world becoming one, frighteningly, they meant it literally. They did want the whole world to look the same, dress the same, eat the same and, most worryingly, have the same cultural, social and political values. After 9/11, Iraq was bombed not because it was a fight against terror but to make ‘the other’ like oneself. America, and other parts of the West, are only now realising the futility of trying to force feed other cultures so-called liberal values in, ironically, the most illiberal way possible. So now, they want to go the other way, and tolerate even the most vile illiberal-ism in the garb of tolerance. First they were trying to force-feed their culture onto others. Now they are trying to pressurize their own culture at home to accommodate an often flawed idea of tolerance. Both, you will realise, are based on an arrogance that sees uniformity as the final goal even while constantly talking about multiplicity. Even in one of my early books “The Liberals”, I questioned the idea of globalisation asking if it is only going to be about the stories of those who left home (Jhumpa Lahiri, Pico Iyer etc), what about the stories of everyone else who remained behind? We now know that these stay-at-home-ers wanted their voice heard. And when for years they could not get anyone to listen, they caused a political revolution around the world. So, where we once believed that leaving home is an act of rebellion, now we now that staying at home can be an equally powerful act of defiance (and in fact if you bring migration forced by war and tyranny, then staying at home seems even more, ironically, courageous). But these two sides do not need to collide. They collide only when a one size fits all formula is applied to either. I have the greatest respect for the American spirit of enterprise, unrelenting hard work and sheer determined doggedness – this, I feel, is something the India of today could learn much from. But we have something to teach too, and that is the lesson of how rootedness can, in fact, be that liberating window of self-confidence through which the world can be best understood with respect and compassion. At the heart of this contradiction is a fundamental misunderstanding about culture – the best kind of cultural respect comes from being rooted and not uprooted. The finest Gandhian lesson is that it is he who is truly devout and recognises that power of the divine who can truly be secular. The best kind of secularism is born not of the idea of tolerance but in the idea of mutual respect. Tolerance is a word fraught with tension. Respect and compassion are far greater ideals. I believe that the Indian way of looking at the world is the way of the future because dharma teaches that external multiplicity can be infinite and can be recognised and respected in infinite ways but it has to be based on a bedrock of compassionate justice. This is important to understand because there can be no true justice without compassion. The path of dharma is neither Left nor Right. It is compassionate about those two, and all other paths because it is the foundation on which all paths must be built. Dharma is concerned with justice. Justice is not about “economics” or “politics” or “religion” – but not one of those can exist without a foundation of justice. My work through my eight books, and everything else I have done from building apps to starting companies, hosting TV shows, and organising festivals, has been to understand a worldview which is based on dharma and which, therefore, has no conflict with multiplicity. In fact it readily embraces multiplicity. The only thing it insists upon is that the multiplicity be based on fairness, equity and justice. Q: Tell us a bit about why you chose Guru Govind Singh as the subject of your latest book “The Sacred Sword: The Legend of Guru Gobind Singh”. A: Because I believe politics has divided even heroes into communities and sects in India. This is tragic. Guru Gobind Singh is not just a Sikh hero. He is an Indian hero. It is time we reclaim our heroes not as different communities or faiths but as Indians. That’s why my next book is on Sardar Vallabhbhai Patel, another Indian hero – not merely a Gujarati hero. Q: Sikhs believe that Sikhism is a separate a religion from Hinduism. As a Hindu how do you react to that? What lessons can India learn from studying the life of the last living Guru of the Sikh tradition? There is no doubt that there is a very large overlap between Hinduism and Sikhism. Even the words Ek Omkar Sat Naam comes from where? Where does Omkar, the word Om come from? Where does the idea that the Truth / God is one but there are many names to the divine come from? So these commonalities are there for everyone to see. However, identity has been deeply politicized in India and therefore obviously there is resistance to talking about commonality. The more there is division, the more there is political profit. Guru Gobind Singh’s life teaches us about the relentless fight against tyranny. This is boy who is jolted to manhood when he is confronted with the severed head of his father. He still retains a sense of poetry in his heart, a sublime sense of spirituality, and even humour. He is never unfair in battle. Never cowardly. But he is also never shy of fighting the good fight. There is no hesitation in him in doing the right thing. He is always above petty politics. There is much to learn from him. Q: You have written on Swami Vivekananda, and Guru Govind Singh, both of whom can be called spiritual leaders with a martial attitude. Do you think India needs a similar kind of leadership today? A: Undoubtedly, the best people to apply power and strength are those least attached to it. Anyway, the tradition of the warrior monk and the ascetic statecraft strategist is a very old and valued Indian tradition. Q: Anyone you have in mind in the current political scenario or in society who embodies those ideals? A: I think it is early days to make that sort of a judgement. After all, think of the all the criticism of Vivekananda during his lifetime. It is only years after his death that he has been truly recognised for his unique contribution. The same can be said to a degree about Aurobindo. Q: During the freedom movement Congress had two broad divisions between the radicals and the pacifists. Pacifists won the battle of public perception in free India. How has this impacted our country in the last 70 years? A: One way of looking at this is to say that, well, freedom was not achieved merely by the power of the spinning wheel and the fast, but also through the results of the war (Second World War) and the numerous revolts and revolutionary attacks. The other way of thinking about this is to make the earlier argument but also be conscious of the fact that both Patel and Gandhi were wary of the attempts to unleash some of a Soviet-inspired ‘class war’ in India – they believed, correctly, that that could not be India’s path. Reconciliation had to be India’s path – otherwise the violence would be unstoppable. So in a sense Gandhi was wise about pushing non-violence as the defining idea and Patel who had his doubts, and used force where it was impossible to avoid, finally agreed with Gandhi broadly on this. Q: Your book “Being Hindu” has been well received. In the light of the recent controversy regarding Lingayat community in Karnataka, how would you define an individual or a group as Hindu? A: I do not believe that the Lingayat agitation is a matter of Hinduism at all. It is a matter of resource allocation and state intervention in socio-cultural policy. The Indian state is still, and will for some time to come, grappling with the idea that its citizens are, and must be, truly free, and must be treated equally. This, oddly, is still a revolutionary idea in Indian public policy. The problems are embedded in policy-making at the very origins of the modern Indian nation state. Unless those issues are solved as public policy cures, we will keep seeing this bitter strife for a slice of the pie and a slice of liberty from the heavy hand of the state. As far as Hinduism is concerned, the answer is very clear: a. the unit is the individual but, here’s the spin in Hinduism that most people find impossible to understand, the fundamental unit is the individual but only at its basest and most un-evolved state does the individual consider only the individual. As the evolution of the individual occurs, which the only journey worth considering in Hindu belief, she realises that the sense of self can, and does, expand to include the universe. Therefore the journey of consciousness of the seemingly individual to the plural which in turn brings about the final sense of unity is the Hindu imagination. But this is not easy to comprehend. Q: Some people who voted for BJP in 2014 seem to believe that the party has not done enough for their core voters. Though it’s early, yet, as a journalist how do you read the political fortunes of NDA for the 2019 general elections? A: I think the rise of the BJP is almost always wrongly analysed and misinterpreted. I would argue that many even within the BJP do not understand entirely why they have been successful. The story, according to me, is more about the continuous transformation that India has seen since 1991 and the rise of the BJP is a bit like a symptom of many of the forces unleashed by those changes. I still believe that we are only in the first quarter of the changes that are to occur in India due to the forces set free in 1991. Q: Any new books in the pipeline? A: Two books are upcoming – the one on Sardar Patel called “The Man Who Saved India” will be published by Penguin later this year, and then a history of the Indian free markets will be released by Simon & Schuster.